A MARBLE OPTION THAT RESISTS STAINING AND ETCHING! I was tempted to name this post “Unicorns Are Real,” because that’s on par with how I felt when I discovered what I’m going to share with you today. I mentioned in a previous blog post that I attended the annual Kitchen & Bath Industry Show (KBIS) in February. It had been several years since I had the opportunity to go to this trade-only event because it always falls at a horrible time of the year for my family (my kids are still little, and my husband is a tax accountant, etc.). Somehow, this year, all the stars aligned and I was able to make the trek out to Las Vegas. The most fascinating thing that I discovered on that trip was Azerocare marble by Antolini. Although I was peripherally aware of Azerocare before, I was under the mistaken impression that it was a sealer. Since I’m a natural skeptic, I dismissed their ground-breaking claims as over-zealous marketing. Is it possible to have REAL marble kitchen countertops that won’t stain or etch? If you’ve never heard of Azerocare, don’t feel bad - you have plenty of company. In my opinion, they are somewhat understated about the whole thing. They seem quite protective, almost low-key about what they have developed (unlike me who’d be shouting it from the rooftops). You see, they are the only ones with this technology at this point, although I’m sure there are other companies who are hot on their heels with research and development. If you were to visit their booth at KBIS, it would be easy to walk away without realizing what was so special about them. They had an exquisite collection of marble, quartzite, onyx, and even unusual granite slabs on display, but if you didn’t walk up to a company representative to ask a few questions, the awe-inspiring reality of their accomplishment could easily be missed. The company claims that their exclusive and ground-breaking technology offers full protection from etching and staining to polished marble, onyx, and soft quartzites caused by contact with acid-based food elements. As I stated in an earlier post about Using Marble Countertops in the Kitchen - it’s really the etching that’s the problem with regular marble. As long as the stone is sealed properly, regular marble will be reasonably resistant to staining anyways. But etching is a real concern. However, Antolini’s proprietary process, if true, has changed all that, as well as giving the stone high stain resistance without the need for yearly re-applications of sealer. Azerocare is not a sealer. It is a proprietary treatment engineered by Antolini (an Italian provider of stone). They claim that the treatment renders slabs of polished marble, onyx, and soft quartzites extremely stain and etch resistant. This is a nano-technology process that is done at the Antolini factory prior to shipping the slabs to a distributor. It cannot be retroactively applied to slabs that are already for sale, or installed. 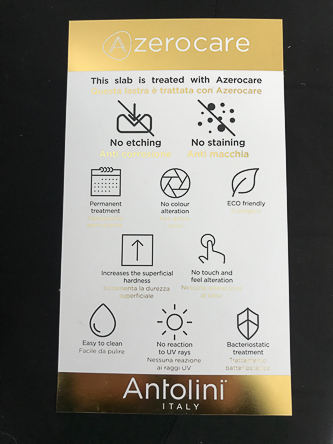 Azerocare also reportedly provides water-repellant and oil-repellant protection from staining and etching caused by oil, fat, and greasy elements. It does not affect the way that the marble, onyx, or soft quartzite looks or feels. It is completely undetectable. I examined slabs of treated and untreated marble myself and could not discern any difference. Once treated and offered as part of the Azerocare line, the slabs will never need any further sealing or treatments. Routine cleaning with soap & water is all that’s required. Each slab undergoes stain and etch resistance testing prior to shipping. They warrant that you can leave an acidic or stain-producing substance sitting on the stone for up to twelve hours without worrying about unsightly marks. Currently, the process is only offered on polished slabs. However, they are working on a technique that can be applied to honed slabs as well. So let’s all keep our fingers crossed! Since I want to give you the most accurate information possible, I decided to conduct a test myself. I acquired samples of Bianco Lasa in Azerocare as well as a separate untreated piece. I applied three things to it that I know from experience are a problem with marble: distilled white vinegar, lemon juice, and olive oil. This first image shows the initial application. The only etch mark made to the surface of the Azerocare piece was difficult to see without sunlight reflecting off the surface, but in the image below you can see how it was not as thoroughly etched as on the non-Azerocare piece. The Azerocare did a fantastic job of repelling the oil, as well as preventing the lemon juice from etching. However, there was a very faint etch mark where the vinegar was applied. In contrast, the untreated sample was distinctly etched from the vinegar and lemon juice. There was also a subtle darkening where the olive oil was applied. I will point out that I checked the test three hours after I applied the substances. The Azerocare appeared to be entirely repelling all three things. So I know the Azerocare was hard at work! Even at twelve hours, the etch mark left behind by the vinegar was far less distinct than those on the untreated piece. The marking was less delineated, less thorough, and less deep, so I believe the Azerocare piece offered a substantial advantage. Even though this didn’t pass my little test perfectly, I would still absolutely recommend this to my clients - with the minor warning not to leave vinegar sitting on it for more than a few hours. For the average consumer, I believe this offers a tremendous benefit. 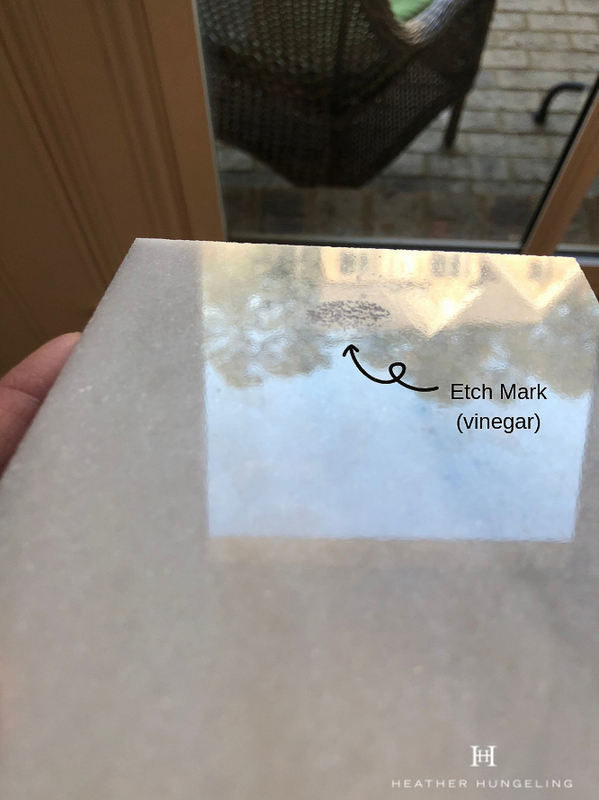 Etch marks can happen so quickly on untreated marble, which is why the idea of using marble for kitchen countertops is such a frightening prospect for many people. If this buys you even a few hours to wipe something up, that’s more than you’ll likely need. Just don’t squirt vinegar all over your counter and then go to bed! WHERE CAN I FIND AZEROCARE SLABS? As you can imagine, Antolini has struggled to keep up with the demand for the first few years after it was unveiled, which is why you may not have heard of it yet in your local market. However, they are starting to catch up, so you can expect a better selection in the very near future. They have distributors in most major metropolitan areas - you can find the dealer list here. I recently visited a luxury stone provider in my local Atlanta market by the name of Pietra Luxury in Stone. 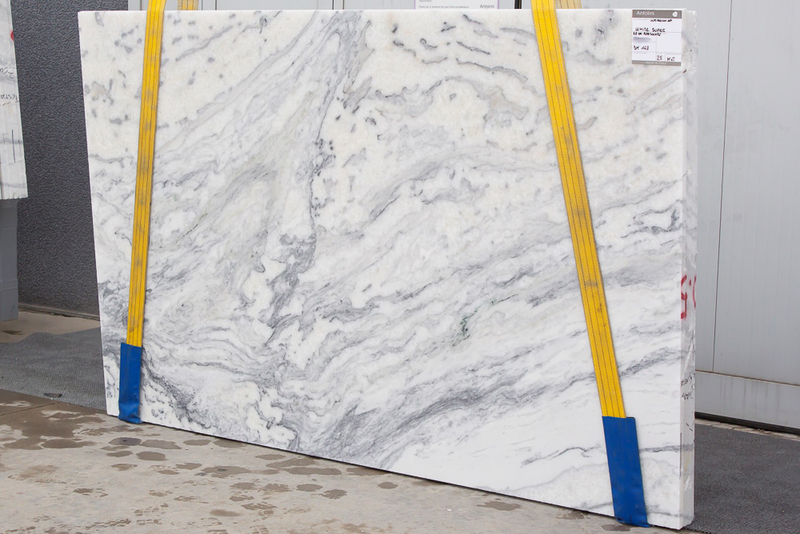 They are an exclusive provider of Antolini slabs of marble, quartzite, onyx and a few granites. In speaking with the proprietor, Tina Vercelote, I learned that their goal is to carry only Azerocare slabs in the future as the supply loosens up. For now, the Azerocare line represents about a 1/4 of their offerings. Tina has graciously supplied me with photos of some of their available slabs at my recent visit. Be sure to look specifically for slabs that have the gold “Azerocare” tag, as Antolini provides untreated stone slabs to their distributors as well. HOW MUCH DOES AZEROCARE MARBLE COST? Tina, from Pietra, was kind enough to share with me that the upcharge cost of going with an Azerocare slab over an untreated slab of the same stone, on average, is about 10-15%. There is some variation to that, as the cost of different stones can vary greatly. This is a no-brainer, in my opinion. This basically boils down to the argument that you can save a few thousand dollars in the short term by going with a regular material, but then risk feeling like you’ve thrown away $10,000+ a few years later. This is highly hinged on whether you’re the type of person who will be bothered by etch marks. I had regular marble in my kitchen for years, and I accepted that as the “patina of time.” However, if I have the option again in the future, I would rather know that my investment would never be degraded by an unsightly etch ring right in the middle of my island. Also, as kind of a footnote on the subject of cost, Antolini is a high-end provider of stone. They quarry and sell highly desirable slabs. In that industry, some distributors get what amounts to “first dibs” on blocks of stone that are brought out of the earth. So those “first dibs” or Grade A batches of stone are going to be the most expensive. After that selection process, it’s opened up to lower grade purchasers. So, in other words, if you try to compare the cost of using Azerocare slabs of Calacatta Oro to using untreated Calacatta Oro from a distributor of non-Antolini slabs, you might find a bigger price difference. Antolini’s slabs are going to be Grade A slabs and finding a distributor that sells Antolini exclusively (like Pietra) will guarantee you that you are picking from some of the nicest slabs available. There have been some problems reported of over-pricing on Azerocare. Since your fabricator is the most likely source of your pricing, don’t be afraid to ask them to break out the cost of the material from the price of the fabrication. You’ll then be in a better position to cross-check the cost through several different quotes and know if you’re being gouged. If you’re trying to compare the cost of using an Azerocare slab versus using the same material in an untreated form from a different provider, be aware of the “name game.” Companies like to make up different names for the same stone so that it will seem exclusive to them and therefore harder to shop around. Antolini uses consistent names on all of their products, which represents the established name and/or quarry of origination. Antolini’s site gives an overview of the different stones offered in Azerocare. So if your local provider does not have it in stock, it can be ordered. Lead-times based upon availability. However, the Azerocare product is not limited to just what’s shown on the website. While at the trade show, I specifically asked about Calacatta Gold, since that’s still very popular with my clientele. He pulled up an image of a massive block of freshly quarried Calacatta Gold and said it was not a problem. So you may be able to put in a special request for a particular stone (not otherwise shown) and have that treated with Azerocare before shipping. Check with your distributor for more information. Another good thing to keep in mind is regarding the edge treatment that you select with your fabricator. If you opt for an ogee edge detail, be aware that the protective process may not extend that far down into the stone. So when your fabricator cuts into it to form the decorative edge, untreated surface area will be exposed. Make sure that you treat that edge with an impregnating sealer - just as you would any regular marble. Finally, if you’re still on the fence about using marble for kitchen countertops, you may wish to read my last post about not settling for quartz and granite just for the sake of being practical. I provide two engineered options that I think are better looking and more durable than quartz, as well as quartzite - which is a beautiful natural stone that won’t etch. (Hard quartzites are harder than granite and won’t stain or etch. Soft-quartzites are like marble and will etch. Make sure you ask for clarification from your stone yard). While I was in Las Vegas for the KBIS show, there was an unusual cold snap. Expecting Vegas to be a pleasant and sunny getaway for a couple of days, I failed to pack anything warm and practical. I dashed from the hotel to the monorail shivering in my lightweight sweater. The last day that I was there, a very rare thing occurred…it actually snowed on the Las Vegas Strip. I think it was a sign! If it can snow in the middle of the desert, then it’s conceivable that you can also have beautiful marble countertops for your kitchen that will be durable and practical! Anything is possible! P.S. Don’t forget to subscribe to my Luxury Resource Library below! Find out about even more amazing sources that I use for my client’s high-end projects as well as get notified about new posts to the Luxury Kitchen Designer Blog!